The deadline is approaching. Nominate a peer for excellence within the industry. 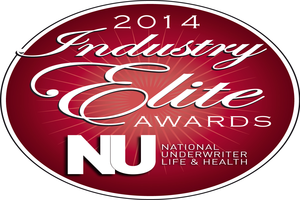 The National Underwriter Life & Health Industry Elite Awards salute the best of the best within the life and health insurance industry, calling out those whose contribution to their business, their trade and their community set them apart from their peers. Market Innovation: The best new product or service introduced in 2014. The Elite Award for Market Innovation will be awarded to the industry professional who put into action the most brilliant new product, service or practice. Submissions will be judged on their level of ingenuity, level of strategic focus, quantifiable returns and peer/client testimonial. Regulatory Advocacy: The greatest legislative or regulatory advocacy on behalf of a company or the industry. The Elite Award for Regulatory Advocacy will be awarded to the industry professional who has orchestrated, affected or inspired a particularly lasting, meaningful and positive regulatory development. The development can be on the state or national level, but submissions will be judged on the degree to which they have impacted the life and health insurance industry. Industry Awareness: The best effort to raise the reputation of a company or the industry. The Elite Award for Industry Awareness will be awarded to the industry professional who has done the most to raise public awareness in a positive manner about the life and health insurance industry, and/or to meaningfully improve the industry’s public profile. Community Outreach: The best effort by an industry professional or organization to give back to the community at large. The Elite Award for Community Outreach will be given to the industry professional who has carried out the greatest act of public service on behalf of his or her own practice or employer, or on behalf of the life and health insurance industry at large. Submissions will be judged according to those who perform especially noteworthy acts of public service. Best Rising Star: The most notable industry professional under the age of 40. The Elite Award for Best Rising Star will be awarded to the industry practitioner no more than 40 years of age who has made the deepest impact in the market or among one’s colleagues relative to length of professional experience. To nominate someone for one of the prestigious Industry Elite Awards, visit our nomination page.